While cars like the Jaguar F-Pace SUV and the Hyundai Kona subcompact SUV scored an impressive five star in the Euro NCAP test, the Fiat Punto scored a zero. Surprisingly, other older cars like the Alfa Romeo Giulietta and Ford C-Max scored three star while the Punto was severely criticised for its low performance. In fact, the Fiat Punto is Euro NCAP's first car ever to be awarded zero stars. 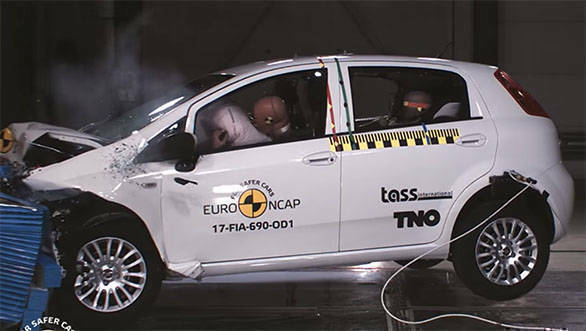 The Euro NCAP crash report states that the passenger compartment of the Punto remained stable in the frontal offset test. The dummy readings indicated good protection of the knees and femurs of both the driver and passenger but structures in the dashboard were thought to present a risk of injury to occupants of different sizes and to those sat in different positions. Protection of the passenger's chest was rated as marginal, based on dummy readings of compression. In the full-width rigid barrier test, protection of the chest of the rear passenger was weak, and that of the neck was marginal. Protection of the driver was good or adequate for all critical body regions. In the side barrier test, chest protection was rated as marginal, based on rib compressions. A side pole test was not performed as the Punto does not have a standard-fit head protecting airbag. The tests on the front seats and head restraints demonstrated poor whiplash protection in the event of a rear-end collision. A geometric assessment of the rear seats indicated marginal whiplash protection. body. Protection of the neck and chest of the 6 year dummy was marginal in this test. In the side barrier impact, decelerations indicate poor chest protection and weak head protection for the 10 year dummy. Protection of the 6 year dummy in that test was good for all critical body areas. The front passenger airbag can be disabled to allow a rearward-facing child restraint to be used in that seating position. However, the information provided to the driver regarding the status of the airbag is not sufficiently clear and the system was not rewarded. Further, the protection provided by the bonnet to the head of a struck pedestrian was predominantly poor or weak, although good in places. The bumper provided good protection to pedestrians' legs and protection of the pelvis was also good or adequate. "The fact that older cars cannot compete illustrates the pace at which the vehicle industry is innovating safety and the willingness and ability of competitive manufacturers to meet the highest standards. Those who do not keep their cars up to the latest standards get left behind, as these results clearly show" commented Euro NCAP Secretary General, Michiel van Ratingen. Fiat has been selling the Punto hatch in India for quite some time now. Unfortunately, the hatch has not garnered numbers for the Italian car manufacturer. 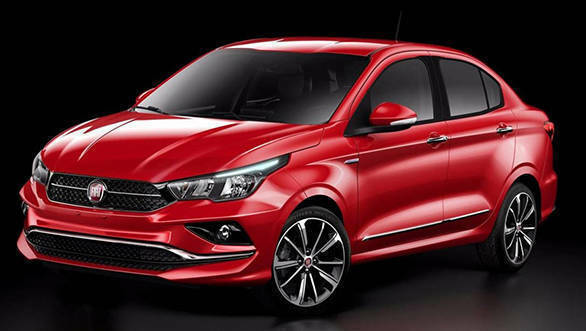 The Fiat Argo and the Crono that has been revealed and are seen as a replacement of the Punto and the Linea cars in the international markets have still not been confirmed for India. We believe Fiat India should seriously consider getting these models into the country.